Drawing on the experience and practice of over twenty-five years, the author celebrates the God and Goddess and the pagan ways of a living, everyday witchcraft. There are ceremonies, unique invocations and ideas for journey work to deepen your connection with the archetypal deities of witchcraft. The male and female mysteries and rites of passage are explored to honour the divine within and rituals are given as inspiration to mark different phases of life, such as coming of age and parenthood. The book gives information on useful healing techniques, with examples to try out for yourself and others. Learn how to make your own casting stones for divination and find meaningful symbols you can relate to easily for readings. 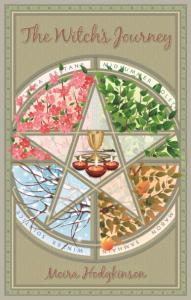 There is an informative section on solar magic as well as looking at the moon in-depth and there are new ideas and tips to celebrate the Sabbats with friends, family or a group. Spell craft, path working and reverence combine in this valuable book to augment your skills and create genuine connections to the energies that are all around us. The Witch’s Journey is perfect for anyone who wants that little bit more from their magical world.